Mike (Keith Kupferer) and Kate (Alana Arenas) only seem protected from the pitfalls of fate in this cushy, linear living area. From the first scene, the Steppenwolf Theatre’s production of Good People is abrasive, both aurally and morally. The play, written by Pulitzer Prize–winning author David Lindsay-Abaire, is a powerful tale of economic hardship charged with class conflict and is an emotional heavyweight on its own. However, it only benefits from director K. Todd Freeman’s intense, unsparing interpretation, complete with a brilliant cast that does an extremely good job of dragging the audience back and forth from one sympathy to another and from one crisis to the next. The play opens with protagonist Margaret (Mariann Mayberry) being fired by her timid, young boss Stevie (Will Allen) in an alley behind the dollar store where they work. She is fired because she was late. Why was she late? Because she was watching her adult daughter who is severely mentally disabled. Why did she have to watch her daughter? Because the woman who is supposed to watch her didn’t show up. Sequences such as this seem to be a recurring theme in Margaret’s life. (She later details how a piece of candy brittle caused her to lose a different job—and a car.) She is now about 50 and once again finds herself laid off from the most recent in a long string of minimum-wage jobs. But Lindsay-Abaire, as he does throughout the play, denies us the moral escape of wholeheartedly siding with the downtrodden Margaret against her evil world, and as the scene develops, Stevie becomes a decidedly sympathetic character, while Margaret’s behavior begins to push us away. To match the subtle fluctuations of sympathy in Good People, Mayberry has created a Margaret who is suitably and beautifully complex. She is, of course, in many ways a victim, but she is also a woman of fierce determination and an expert in manipulation, and the breadth of her character is revealed in the third scene in Mike (Keith Kupferer)’s office. Mike is an ex-boyfriend from high school who is now a successful doctor, and Margaret has come to ask him for a job. She viciously needles Mike for being “lace-curtain Irish,” manipulates him into inviting her to a party at his house, and probes him thoroughly for job opportunities, all the while taking a real pleasure in his success that sometimes verges on giddiness. At one point, Margaret recites her various misfortunes as part of a joke but surprises herself by dissolving into tears. Reading the script, I pictured the transition as an outburst, but Mayberry gave just one quiet sob before covering her face. Her body appeared to collapse inward as she—and the entire theater along with her—fell into a profound silence. Good People unfolds in an alley, in a kitchen, in an office, at bingo, and in a living room, each set becoming intimately involved in the action it foregrounds. The backdrop of an overflowing dumpster complete with a greasy bag of McDonald’s heightens and somehow universalizes the bleak nature of the opening scene. Mike’s office—white, sterile, linear—and his equally linear house, expertly organized as if to insulate its inhabitant from the uncertainties of fate, both contrast sharply with the browns and yellows of Margaret’s run-down, cramped kitchen with its clutter and haphazard decorations. To the end, Mike remains convinced that he is successful because he worked hard, while Margaret chalks it up to luck. Lindsay-Abaire’s treatment of this tension remains nuanced throughout with the possible exception of the final plot-twist, which both reveals where his sympathies really lie and removes a level of depth from the conclusion. 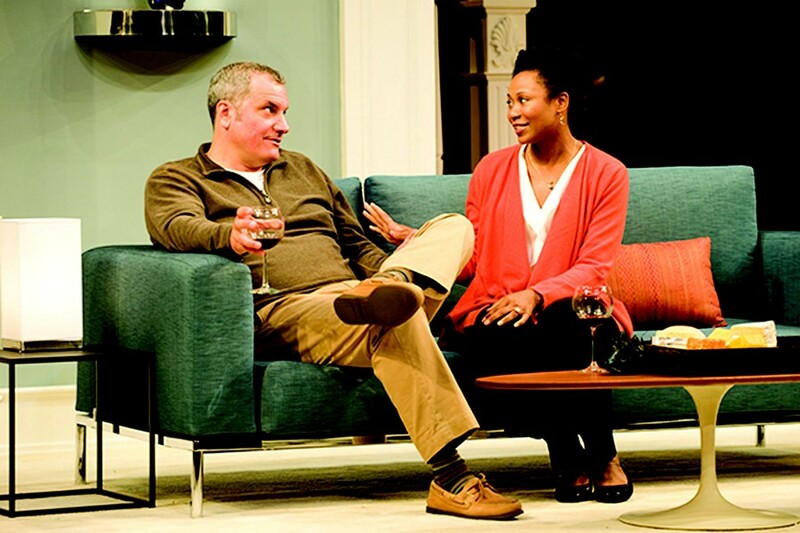 Good People, Steppenwolf Theatre, through November 11.